Saturday 31st May 2014 was a glorious day for the record attendance of runners participating in the third annual Kent Roadrunner Marathon. 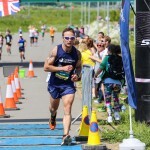 Organised by the tzruns team and held at Cyclopark in Gravesend, Kent, this marathon is rapidly earning a reputation as the “must do” event of the year for avid marathon runners. Precision perfect organisation and with phenomenal attention to detail, the tzruns team certainly know how to host a running event for runners. Personalised race numbers, free photos, inspirationally designed medals and t-shirts as well as free showers, WIFI and a brilliant onsite café are just some of the reasons why this marathon is getting more and more popular every year. Another speciality of this event is the showboating competition – rewarding runners for some outlandish jumping, leaping and dancing during the race. This year runners were competing to win a trip to the Frankfurt Marathon courtesy of 209:Events. Running 17 laps of the sooth tarmac racing circuit was all that was required to earn the right to wear the UK’s biggest finisher’s medal with pride, something that 355 people successfully did. At the front end it was Adam Holland that set the pace early in the race. Following on from his recent victory in Brathay 10 in 10 he led the runners around the course, with Adam Stokes and Simon Sikora hot on his heels. 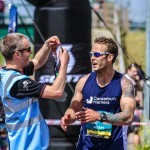 Ultimately it was Adam Stokes that paced his race to perfection and was the first to cross the finish line in a personal best time of 2:42:13, setting a new course record in the process. He was followed over the line by Simon Sikora (2:47:21) with Adam Holland securing the final podium position (2:48:09). Runners throughout the field were complimented the leaders for their never-ending encouragement and support that they offered their fellow runners as he lapped them. This is sportsmanship at its best. In the ladies’ race Sally Ford led the race from start to finish and looked comfortable as she negotiated each lap. 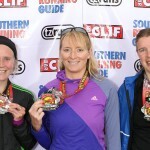 She crossed the line in 3:17:39 followed by Helen James (3:25:59) and Rebecca Bryant (3:36:21). 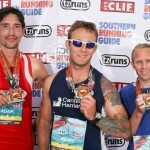 The race was generously supported by CLIF Bar, Southern Running Guide and Scott Sports. 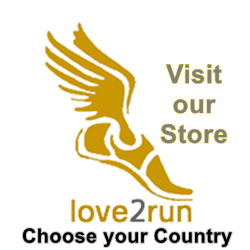 tzruns was formed by Ian J Berry and Sandra Bowers with over 200 marathons experience, to be the best and most fun event for all participants and helpers. Their events have become as famous for their slick organisation as they have for their fan-friendly touches and enormous medals! 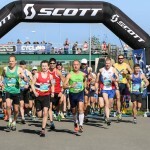 Click here for details of the 2015 Kent Roadrunner Marathon. Click here for more details of the 2014 Kent Roadrunner Marathon.